What everybody knows about air fighting in WW2 turns out to be less than the whole story. Fighter Command fought obsolete tactics, Bomber Command fought unpredicted weather, and the Desert Air Force fought plagues of flies. Then there was the enemy, of course. And after the war, a different kind of enemy and a different kind of bomb. Nutshell: Deterrence calls for a threat of retaliation. But nobody mentions that fact. Hullo Russia, Goodbye England sees the return of Flight Lieutenant Silk. Having survived a double tour on Lancasters in WW2 (and won two DFCs), he rejoins Bomber Command much later and qualifies to fly the Vulcan bomber. Welcoming him, the airbase commander says: "You have the best, and the worst, job in the world. You have the Vulcan, incomparably the finest bomber. That's the best bit. Your job is to fly to the Soviet Union and destroy cities. That's the worst bit. If Moscow decides to go berserk, Soviet bombers can attack us with nuclear weapons - enough to turn these islands into a smoking wasteland. Only one thing can deter Moscow, and that is fear. If Moscow decides to obliterate Britain, it does so in the sure and certain knowledge that Britain will obliterate Moscow and two dozen cities from Leningrad to Stalingrad. You will do that. And be in no doubt: you will do it. No turning back." When Skull, the squadron Intelligence Officer, meets Silk, he warns him: "We play for the highest stakes, nothing less than the survival of civilisation itself." "I've heard that speech," Silk says. "It was all balls then and it's all balls now." 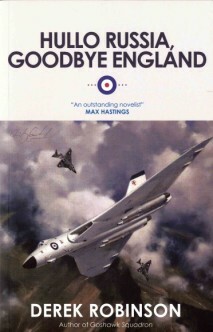 Nutshell: Disliked by the air marshals, but many ex-Battle of Britain pilots read it and said this was the way it was. 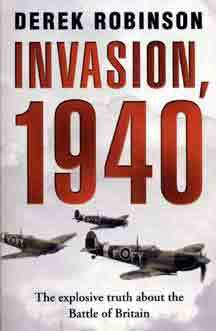 "An outstanding novelist's brilliantly researched portrait of the war in the air and the men who fought it." "Dead on target: midway between Catch-22 and The Winds of War." Nutshell: Hornet Squadron is in North Africa. The bad news is that it's all sand. The good news is you can have as much as you like. 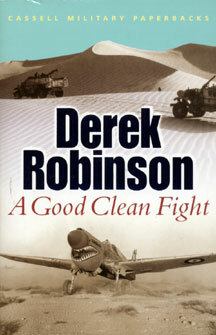 "Nobody writes about the war quite like Derek Robinson. He has a way of carrying you along with the excitement of it all before suddenly disposing of a character with a casual, laconic ruthlessness that is shockingly realistic..."
"Biggles was never like this." Nutshell: RAF Bomber Command fought the enemy from Day One of WW2, night after night. Somebody had to. "Robinson.. should be mentioned in the same breath as Mailer, Ballard or Heller. A masterpiece. " "..tough, taut prose that pulls you through the book like a steel cable." Nutshell: 1940 was a rich year for myths, from unstoppable German paratroops disguised as nuns, to expert predictions that six months bombing would cause two million British casualties.But the most enduring myth is twofold. First: that RAF Fighter Command could have stopped a seaborne German invasion. Second: that, without the RAF, Hitler would have conquered England. Neither of them true. "A tremendously interesting and fun read! .... a thought-provoking book that will change the way most of us look at the Battle of Britain..."
The four-engined delta-wing Vulcan was RAF Bomber Command's last hurrah, and piloting it was an unforgettable experience. A Vulcan could let a jet fighter take off first and then leave it standing in a climb that soared to fifty or sixty thousand feet. A Vulcan could be airborne in under two minutes from the scramble order, and nudge the speed of sound as it penetrated the Soviet Union to release its stand-off nuclear missile a hundred miles from the target. No other aircraft came close to its all-round performance. Yet if Vulcans ever carried out their task, the act must be a colossal failure, the worst in human history, perhaps the end of all history. For Vulcans existed only to make a second strike, in retaliation for the enemy's first strike. Thus Vulcans would pile nuclear annihilation upon nuclear annihilation. North Africa, 1942. Dust, heat, thirst, flies. Nothing to harm but the sand, the enemy and yourself. A good clean fight, for those who like that sort of thing, and some do. From an advanced landing ground, Hornet Squadron's clapped-out Tomahawks go ground-strafing. Simultaneously, an S.A.S. patrol drives hundreds of miles to get behind enemy lines and hit his airfields. Airmen and soldiers alike are painfully exposed to retaliation, and German Intelligence has plans for that. Good news for the flies. Why didn't Hitler invade England? The big military historians, starting with Winston Churchill, have had no doubts. Churchill named 'the stamina and valour of our fighter pilots' and declared: "Thus Britain was saved," Sir John Keegan goes further: he states that "2,500 young pilots had alone been responsible for preserving Britain from invasion" Other examples are plentiful. Yet the historians fail to explain exactly how Fighter Command could have prevented an invasion fleet from crossing the Channel. The hard fact is that the RAF's fighters could never stop a seaborne invasion, any more than the Luftwaffe could guarantee one. So what frightened Hitler? The Royal Navy. Read all about it. The R.A.F. Quartet is available now from MacLehose Press in bookshops, except in North America. The R.F.C. books will be in bookshops in January 2013. Other titles may be found in seconhand bookshops. Almost all titles except A Splendid Little War are available as e-books. These websites may be useful in tracking down copies.